It smells like sulfur when I do a load of laundry. Now, my clothes, bedding, and towels don’t come out smelling like that, but the laundry room is like the bottom of a cave odor-wise. The sulfur odor (rotten egg smell) that you are smelling is hydrogen sulfide gas. Hydrogen sulfide gas is a natural product of decay, and in a residential setting, is most commonly a result of decomposition in septic or sewer system. When you put your washing machine in the spin cycle it is likely that not all of the water is draining out and it begins to build up bacteria and produces hydrogen sulfide. Okay, so all the water isn’t draining, thus growing bacteria. Now, I don’t want to call “the guy”. Because, I know “the guy” knows only one thing: MAKE IT AS EXPENSIVE OF A PROBLEM AS POSSIBLE! I’m sure you can relate. I don’t want to buy a new washing machine. Once again because I have to deal with “the other guy”. “The other guy” only knows one thing: MAKE IT AS EXPENSIVE AS POSSIBLE. I went into the wrong business. I should have became one of these guys. So, then I thought if I was one of these guys what would I do: MAKE IT AS CHEAP AS POSSIBLE FOR ME THEN MAKE IT AS EXPENSIVE AS I CAN FOR THEM. Solution: Become one of these guys. Now, I’m not going to be able to go to class and get certified. I’m not going to be able to train to do this job. So, I’ve turned to the most inexpensive place I can think of. THE INTERNET. There are millions of do-it-yourself things that someone either smarter, or more handy has come up with who has the exact same problem as me. All I needed was a few things. And the funny thing is I already had them, but if you don’t they are so easy to find. Distilled White Vinegar –>This can be found in the baking aisle of pretty much any grocery store. Baking Soda –> Once again any baking aisle of any grocery store. 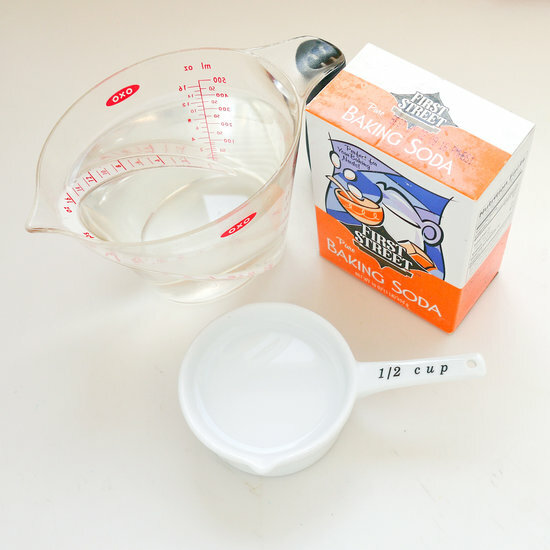 A Measuring Cup –>You most likely have this already, but if not, the baking aisle again. Once done: REPEAT ALL THE ABOVE STEPS. That’s it! I didn’t pay hundreds of dollars to fix the problem. The problem is fixed for around 5 dollars. That’s it. It works and that smell is now gone. I just try to do this once a month. I usually do it on a weekend when a game is on, so kill two birds with one stone. I hope if you have the same problem this helps you out.